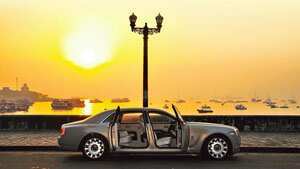 Joyride: The Ghost EWB which the author test drove through Colaba, Mumbai. It’s a bit like travelling back in time and meeting Aladdin, and getting a magic-carpet ride. That’s what the Rolls-Royce Ghost Extended Wheelbase (EWB) could do to you—scramble for fairy-tale metaphors. Within the Ghost EWB, should Aladdin rub his lamp, you needn’t worry—there is an abundance of space to allow the resulting giant genie to stretch out in style. The Rolls-Royce Ghost was introduced across global markets, including India, in late 2009. 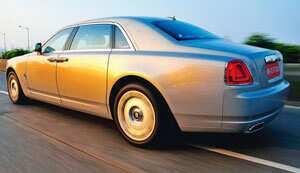 It was enthusiastically received as the Rolls-Royce that the owner could enjoy driving as much as being chauffeured in. The rear cabin of the Ghost delivers oodles of comfort and class to sink into after a taut and aggressive day in the boardroom and the driver’s seat delivers therapeutic thrills on a relaxed weekend out motoring. If you look at the Ghost and the Ghost EWB separately from the outside, you’d be hard-pressed to notice the extra length of the latter unless they are standing side by side. But if you’ve ever sat inside the Ghost, you’ll at once notice the extra roominess when you enter the Ghost EWB. The Ghost EWB is 170mm longer than the Ghost and most of this extra length has been spent on making the rear roomier. The knee-room has stretched from 160mm to a whopping 330mm. For all this extra length and the standard panoramic steel roof, the weight has gone up by just 30kg. I got into the driver’s seat which I could finely adjust to my height and reach and then feasted my eyes on the instrumentation and panelling much of which—in keeping with the marque’s tradition—has been painstakingly built by hand. And, it’s a wonderful blend of tradition and technology that while you can configure your Rolls-Royce through the futuristic multimedia interface (MMI), the push-pull knobs to open and close the air-conditioning vents remain deliciously old world. As is the pre-World War II font used for the letters inscribed on the switchgear and instrumentation. There is also no tachometer to tell you mundane things like revolutions per minute. In its place is a power reserve meter, that starts at 100% at idle and declines as you accelerate telling you how much power you have in reserve. And there is always ample power in reserve. For all its length and presence the Ghost EWB is actually fun to drive. Smooth, stately and calm, you’ll need to drive this car for just a few minutes to know why Rolls-Royce is considered the epitome of motoring. Under the hood resides the 6.6 litre twin-turbocharged V12 engine, the same as that of the Ghost, and it makes 563 bhp which it delivers through an 8-speed automatic gearbox in that famed Rolls-Royce whoosh rather than fist-in-the-chest or neck-snapping acceleration. But that doesn’t mean it’s not quick. With just a gentle caress on the accelerator, it did 160 kmph in a careless sigh. I remember at a traffic light on Marine Drive in Mumbai, I put the accelerator down and the Ghost simply glided away with the other traffic rapidly disappearing into the rear view mirror. It will also go from standstill to 100 kmph in just under 5 seconds. For all its generous proportions, the car is quite easy to weave through traffic. The steering is precise and the car responds with a uniform surge to dart through traffic. I know this from driving through Mumbai’s rush hour at Worli and Peddar Road. There was never a hint of any cumbersomeness. It is only on very uneven road surfaces that some road noise filters into the front cabin. But at the rear, it is isolation at its very best. When the characteristic coach-style doors softly click shut, you can have a cocoon of quiet if you wish or a rock concert if you so please. An audio system delivering 600 watts through a 10-channel amplifier and 16 speakers can turn this car into a concert hall. While all this is standard, you’ll rarely find two identical cars because like all previous models from Rolls-Royce, the Ghost EWB is bespoke. It is painstakingly customized for its owner. Which is why, should you want a footrest in your car, the company would probably obtain measurements for your inner leg and shoe size to get it just right. If you want a bar, they’ll ask for your preferred tipple to ensure that the bar is suited to that bottle’s shape and size. These are just two examples in the myriad details that make every Rolls-Royce unique, special and a possession to cherish. • The Rolls-Royce Ghost EWB starts at ₹ 3.05 crore. The final price is dependent on customer specification. • Bookings are already open and delivery takes about 2-3 months as most of the car is built by hand.